Hello once again guys! Today, I have for you the 19th weekly base review. We analyze the base design along with building level. Today I will be analyzing Nir from the clan VungTao Bro! 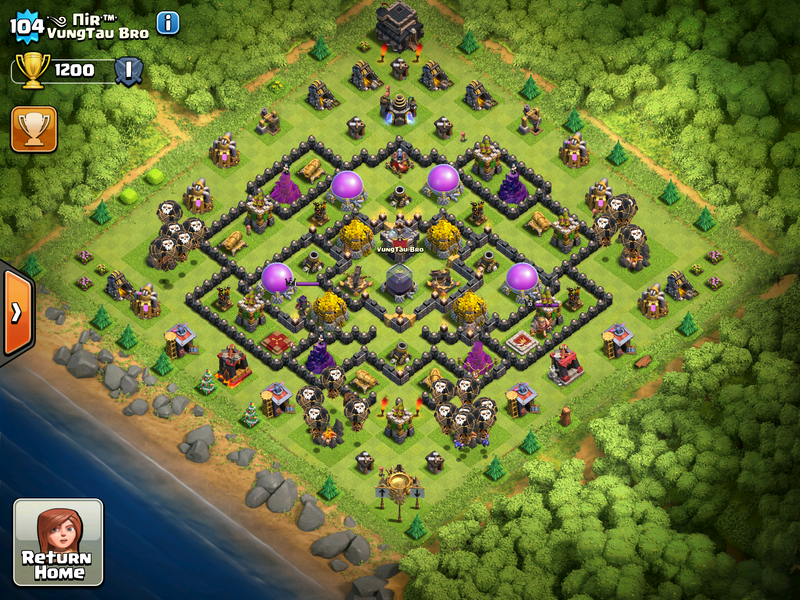 -Maxing Town Hall 9: Your base is looking amazing so far! Those walls are well upgraded and everything seems to be relatively high level! -Wall Level: It’s always nice to see some level 9 walls are TH9. It wards off attackers and makes it look harder to beat you. -Boastful Barracks: Maxed elixir barracks, all level 10!! Also your dar barracks are looking pretty good as well! Keep it up. -Hero Level: I see a level 10 barb king and a level 7 queen. Get those both to 15 and you will be gold, my friend! -Point Defenses: This means cannons and archer towers. They are still a TH8 level; try and upgrade them once more! -Level 5 Walls?! : Strange, so assume they are for something special? Still they are hurting your overall design, so I would upgrade them. Favorite feature of base: The base design!!! I truly love this base design, and might actually consider using it for myself if you don’t mind! It flows very well and looks intimidating to attack. Maybe a future base build using it? Also, isn’t it better to not look like a hard base but be a hard base? cause that will get you more defense wins. For example, in clan wars, if you have an amazing base that looks like a weak base, you will get attacked by weaker attacks, and they will fail, giving your clan an advantage. Also, I think that the collectors and barracks and anything outside the wall, with the exception of the town hall, should be placed as close as possible to the walls, or they can be taken out by a single archer, making it extremely easy to get 50% on bases like this, even with barch. But, I really like this design. It can easily funnel the troops around the base, so you will have the full use of theose two long ranged x bows in the middle. And since they are not just level one, it will intimidate attackers into just sniping your town hall and moving on. However. I would say the lower air defenses should be moved in a little, or they can be taken out easily with 5 or 6 balloons. At first glance, I’m just saying: what are those level 5 walls doing there?